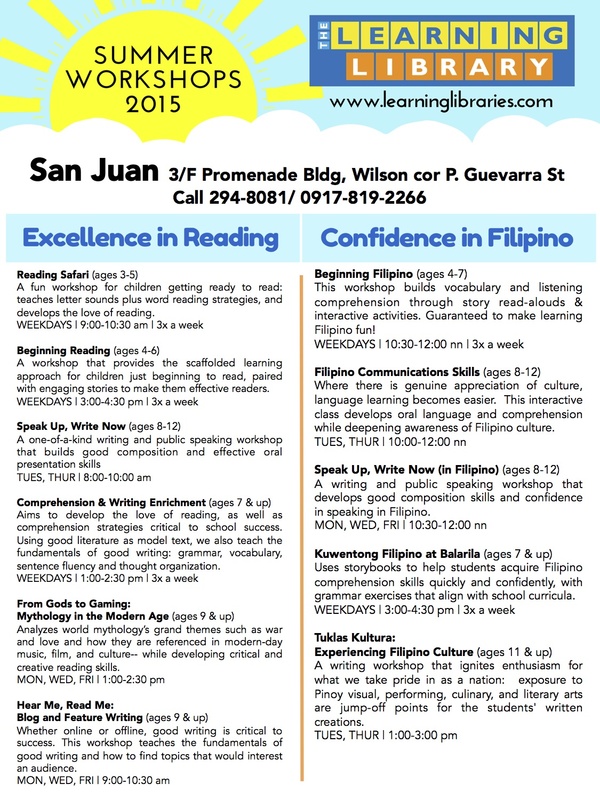 Here’s the schedule of Reading and Filipino workshops at our San Juan branch. Fee is P4,800 per month inclusive of assessment, materials and book borrowing privileges. Early bird and sibling enrolment discounts available. Reserve a slot now at http://bit.ly/tllregistrationsummer . Our 1st Summer Run will begin on April 6- May 4 and 2nd Summer Run on May 6- June 1. Those who cannot start on the first day will be given a maximum of 10% discount. We will do our best to accommodate all of the students but please note that the Learning Library reserves the right to dissolve workshops that do not make the minimum number of enrollees. 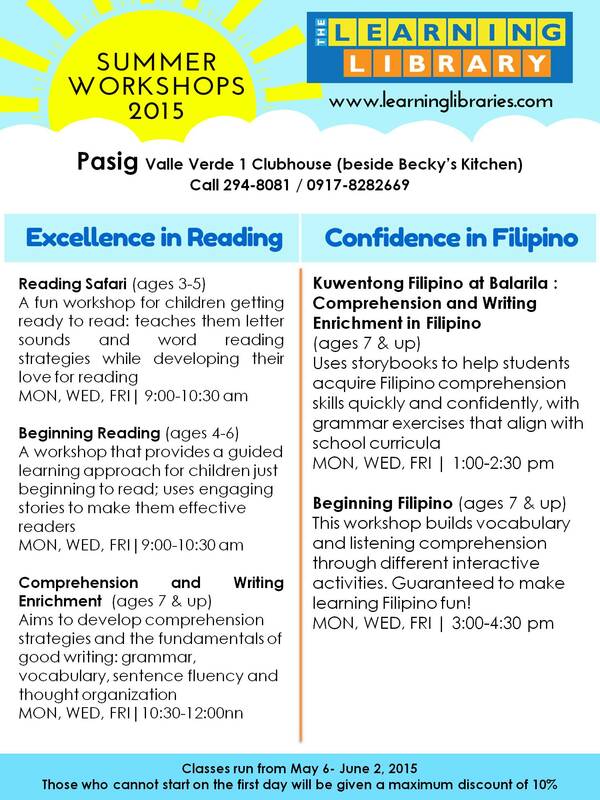 Here’s the schedule of Reading and Filipino workshops at our Pasig branch. Fee is P4,800 per month inclusive of assessment, materials and book borrowing privileges. Early bird and sibling enrollment discounts available. 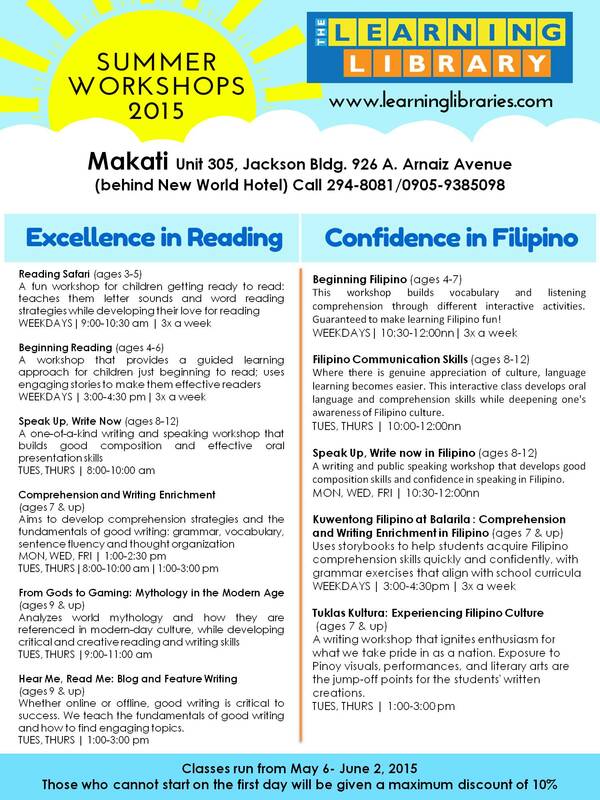 Reserve a slot now by calling us at 294-8081. Classes run from May 6 to June 1. Those who cannot start on the first day will be given a maximum discount of 10%. 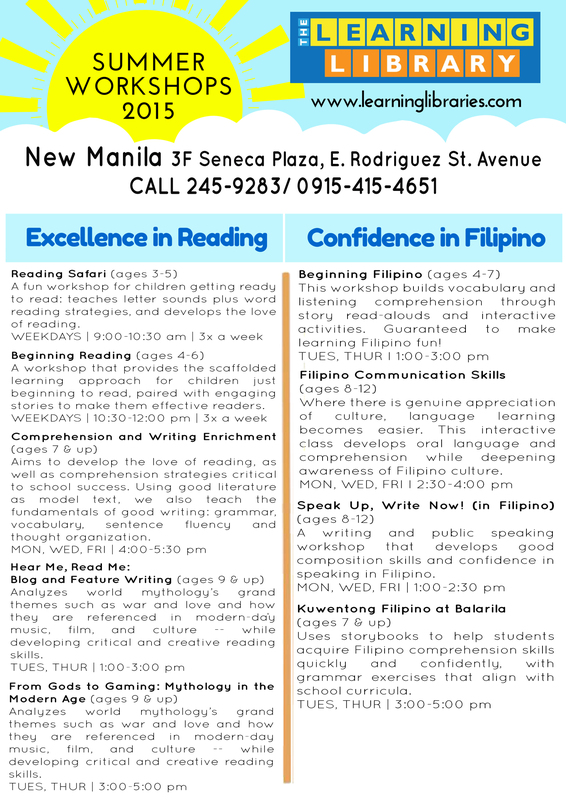 Here’s the schedule of Reading and Filipino workshops at our New Manila branch. Fee is P4,800 per month inclusive of assessment, materials and book borrowing privileges. Early bird and sibling enrolment discounts available. Reserve a slot now at http://bit.ly/tllregistrationsummer . Our 1st Summer Run will begin on April 6- May 4 and 2nd Summer Run on May 6- June 1. Those who cannot start on the first day will be given a maximum of 10% discount. 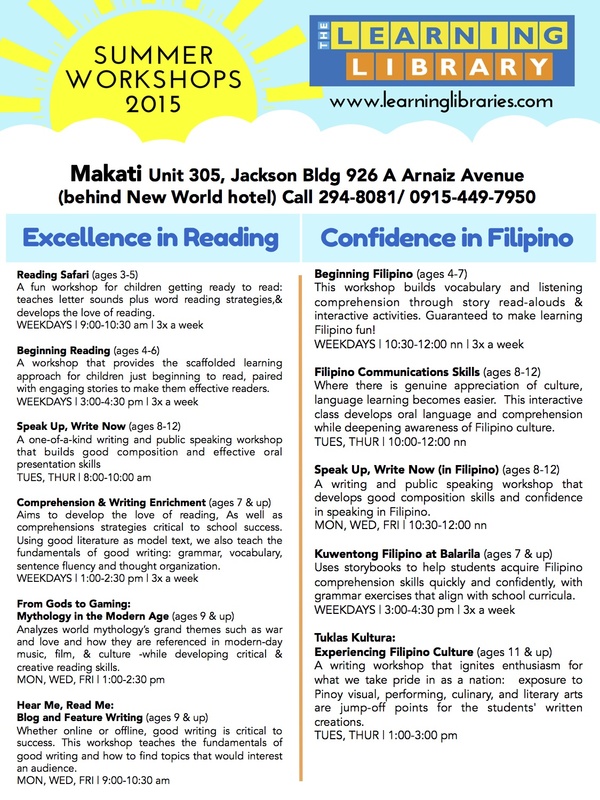 Here’s the schedule of Reading and Filipino workshops at our Makati branch. Fee is P4,800 per month inclusive of assessment, materials and book borrowing privileges. Early bird and sibling enrolment discounts available. Reserve a slot now at http://bit.ly/tllregistrationsummer . Our 1st Summer Run will begin on April 6- May 4 and 2nd Summer Run on May 6- June 1. Those who cannot start on the first day will be given a maximum of 10% discount. 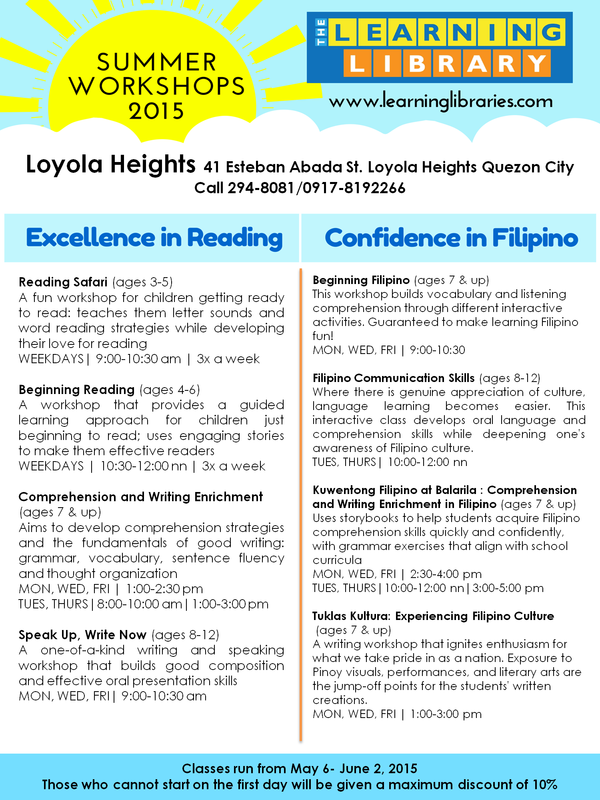 Here’s the schedule of Reading and Filipino workshops at our Loyola Heights branch. Fee is P4,800 per month inclusive of assessment, materials and book borrowing privileges. Early bird and sibling enrollment discounts available. Classes run from May 6-June 2. Those who cannot start on the first day will be given a maximum discount of 10%. 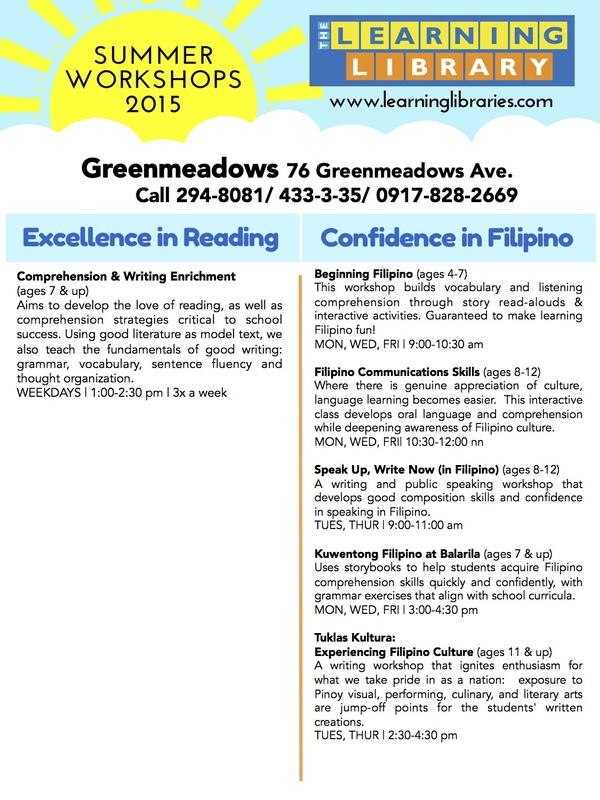 Here’s the schedule of Reading and Filipino workshops at our Greenmeadows branch. Fee is P4,800 per month inclusive of assessment, materials and book borrowing privileges. Early bird and sibling enrolment discounts available. Reserve a slot now at http://bit.ly/tllregistrationsummer . Our 1st Summer Run will begin on April 6- May 4 and 2nd Summer Run on May 6- June 1. Those who cannot start on the first day will be given a maximum of 10% discount. 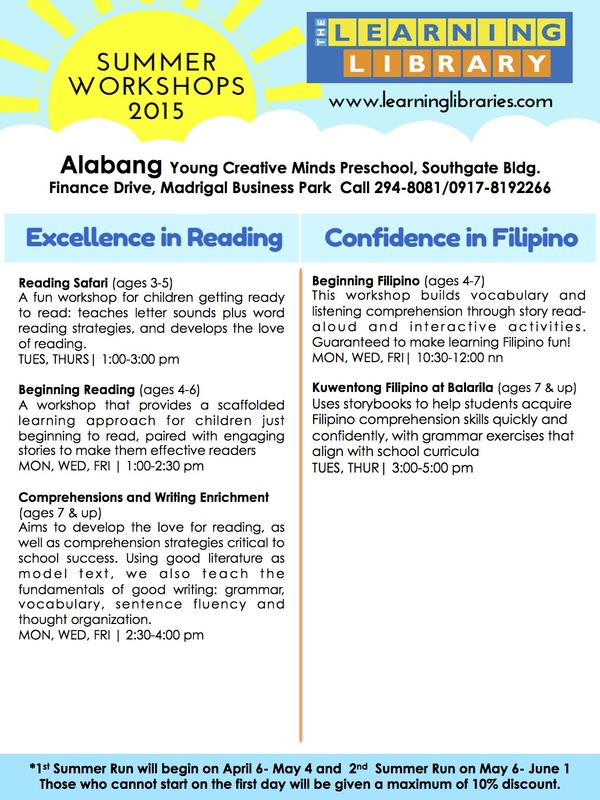 Here’s the schedule of Reading and Filipino workshops at our Alabang branch. Fee is P4,800 per month inclusive of assessment, materials and book borrowing privileges. Early bird and sibling enrolment discounts available. Reserve a slot now at http://bit.ly/tllregistrationsummer . Our 1st Summer Run will begin on April 6- May 4 and 2nd Summer Run on May 6- June 1. Those who cannot start on the first day will be given a maximum of 10% discount. We will do our best to accommodate all of the students but please note that the Learning Library reserves the right to dissolve workshops that do not make the minimum number of enrollees.